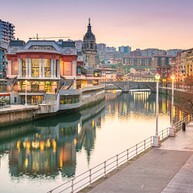 The Basque city of Bilbao is a spellbinding capital of design and gastronomy. With one of the world’s finest buildings - the Guggenheim - at its heart, Bilbao dazzles with style and energy and boasts a unique identity and still speaks Europe’s oldest and most enigmatic language. Opening hours: Most shops are open from 09.00–13.30 and 16.00-20.00 Monday to Friday. Banks are open 08.30–14.00, Monday to Friday and 09.00–13.00 on Saturday. 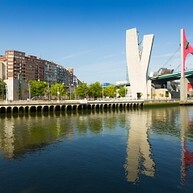 Bilbao has many interesting sites to visit, both historical and modern, and there is something for everyone. In addition to museums, such as the Guggenheim, or the lively Old Town, Bilbao's many pedestrian streets make it easy to discover the city on foot. 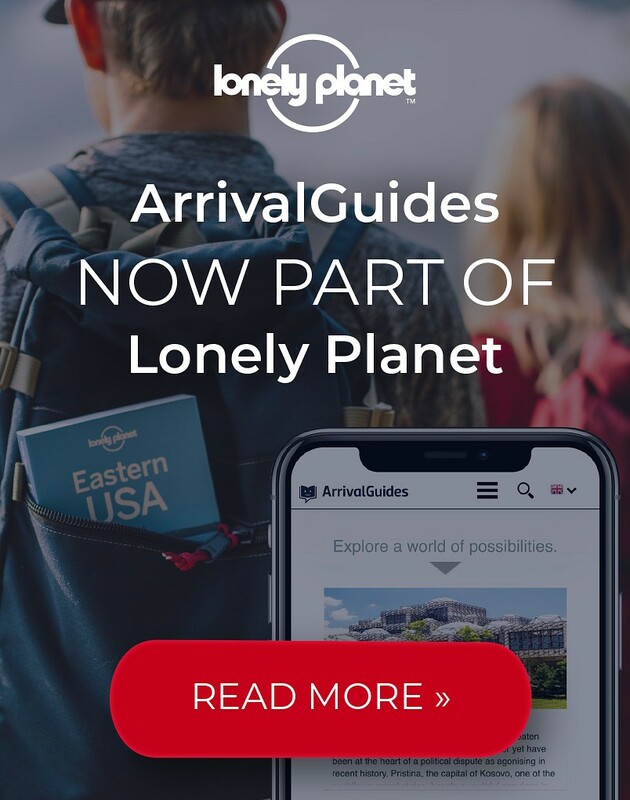 All you need to do is find your favourite sites. From the ultra-modern Conference Centre and Concert Hall Palacio Euskalduna Jauregia, walk East along the riverbank, which is filled with beautiful sculptures and some very impressive modern architecture. You will pass the Guggenheim and Santiago Calatrava’s stunning Zubi Zuri Footbridge, which spans the Nervión between the Guggenheim and the Ayuntamiento. The Guggenheim Museum Bilbao only opened in 1997, but it has since become one of the most revered and celebrated buildings in the world. 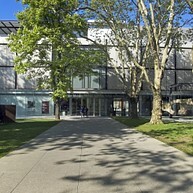 The museum’s collection focuses primarily on 20th-century American and European art. Just like the popular saying, it's not just the outside that counts - but it's pretty important for this museum. Architect Frank Gehry designed the building with the vision of ''letting the randomness of the curves catch the light". After the opening of the museum, the building was said to be one of the masterpieces of the 20th century. 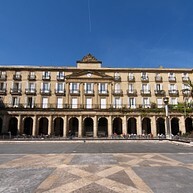 The Museo de Bellas Artes has an exceptional collection of traditional works by well-known masters such as El Greco, Goya, Gauguin, Francis Bacon, Picasso and Velazquez. The era of the collection begins in the Middle Ages all down to the contemporary art of today. 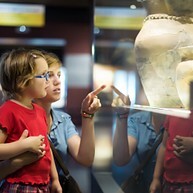 The museum has been around since 1908 and started as one of the first Fine Art museums. The popularity of the museum caused the extension of the building with another part in which the rest of the art could be displayed. This museum used to be a former convent, founded in 1515. It contains an intriguing selection of religious art and crafts dating back to the 12th century, including religious silverware, sculptures, paintings and ceramics by Basque artists. The permanent exhibition is divided into three large sections: sculptures and paintings, gold work, and garments and ornament. The Ría de Bilbao Maritime Museum is a place to uncover Bilbao’s past as a shipbuilding and seafaring hub. Outside there are striking floating exhibits with special exhibitions. The exhibitions are structured around three main themes: physical environment of the estuary, the evolution of trade in Bilbao, and the development of shipbuilding in the Bilbao estuary. One of the most striking features are the many mini-ships made entirely out of wood, with incredible attention to detail. The original theatre, created by Joaquin Rucoba (also known as the Spanish Mozart), burned down in 1914 and a second one was built, resembling the Opera House in Paris. 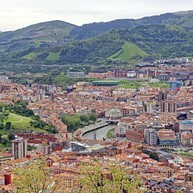 Today, it remains the major cultural venue of Bilbao. Beautifully located on the banks of the Nervión, the theatre is host to world-class opera, classical music concerts and ballet. Besides shows, you can also take a guided tour behind the scenes and see the opera costume collection and the stunning stalls. Just outside Bilbao, between Getxo (Las Arenas) and Portugalete in the Region of Bizkaia, is one of Bilbao’s main attractions: Puente Colgante, also known as the “Hanging Bridge.” There are two dramatic ways of crossing it: by gondola or along the crosswalk itself. If that hasn't convinced you yet, the bridge has been declared a World Heritage Site by UNESCO, for being 'a perfect combination of beauty and functionality'. There are 64 arches around this enclosed square, which is the oldest surviving square in town. Built in 1849, it’s a perfect place to stop, drink coffee and watch the world and the people go by. One of the cafes that you can try is the famous Cafe Bar Bilbao. Sure, the name is not very original, but they are known for their pintxos, especially the squid pintxo and the ham and onion one. If you want to escape the city streets, this is the right place for you to catch your breath and look at Bilbao from a high elevation. At the Artxanda viewpoint, you can enjoy a magnificent panoramic view of the city and the beautiful mountains. There is a an elevator available to reach the top. Plentzia is a happening resort just outside Bilbao, in the Region of Bizkaia, on a hilltop centre that leads to lovely sandy beaches. Plentzia is a popular weekend destination and there are bars and cafés of which many serve fresh seafood. The town even has an indoor front where you can watch the traditional sport of the Basque: pelota. What exactly is Basque pelota? It's almost impossible to explain, so head over to the indoor front and find out. This town is set between two hills around the beautiful La Concha Bay. San Sebastian makes for an unforgettable day trip, where you can take in the glorious Belle Epoque balustrades and visit its world famous restaurants. There are four areas that you definitely must visit. The first one is Parte Vieja, old town, here you can find the popular pintxo bars and eat your heart out. South of Parte Vieja is the place to be for the shopaholic, the commercial shopping centre. On the East you can be welcomed by the beach. The final one, Playa de Ondarreta is the 'posh' neighbourhood of San Sebastian. Doña Casilda Park is situated at Paseo Don Jose Anselmo Clave, next to Museo de Bellas Artes. The park was built in 1907 by an architect called Ricardo Bastida. When you stroll around at this park, you will see a dancing water fountain, basketball pitches and a pavilion for live performances. If the directions are not clear, you can ask a local where the 'Parque de los Patos', or the duck park, is. Why, you might ask? In the centre of the park you can find a huge duck pond known for the variety of waterfowl. Explore the city by bike either by yourselves or as part of a guided bike tour. 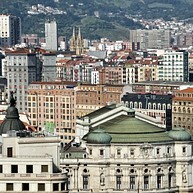 This is a different way to get to know Bilbao and to learn more about its culture. One of the more popular bike tours is the tour provided by the international Baja Bikes. The bike tour will provide you with a local English speaking guide and take you to all the highlights of Bilbao, such as the Guggenheim museum. It even includes a variety of pintxo's and a drink, a nice way to refresh after cycling your way through the city. 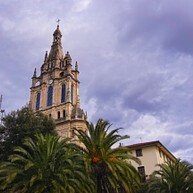 You will find Basilica of Begoña at Calle Virgen de Begoña on the top of a hill. The church construction started in 1511 and it is widely held that the virgin Mary appeared at that exact spot. You can see that the church is still important to the sailors of Bilbao. There are still ships which are named after the church, Virgen de Begoña or just Begoña. Experience history first-hand when you walk through the doors of the Basilica of Begoña. The white structure of the impressive pedestrian bridge over Nervion River can be seen from far away on a sunny summer’s day in Bilbao. 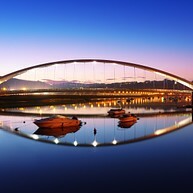 It's extra special since the bridge is designed to look like a sailboat, ten metres above the river. Zubizuri connects Campo Volantín Boulevard with Uribitarte, and from the bridge you have a stunning view of the Guggenheim Museum. There used to be a glass floor, but after complaints the city decided to place a non-slip mat. So even when it's a rainy day, you can walk there safely. St. James is the patron of Bilbao, and this cathedral is dedicated to the saint. The Gothic architecture dates back to the 15th century, which makes it the oldest church of Bilbao. It has been renewed several times throughout the years. There are several reasons why this is such a peculiar church. For instance, it's not built in one style, but a combination of three. There is a Gothic cloister, a Renaissance portico, and a neo-Gothic spire.